Gaiman, Neil. 2008. The Graveyard Book. With illustrations by Dave McKean. I really loved this one. The atmosphere, the pacing, the characters, everything is just right with this one. 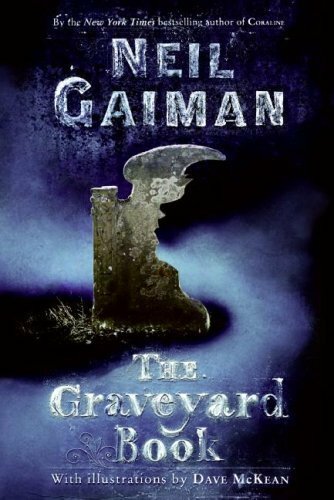 The Graveyard Book is the story of a young boy, Nobody Owens, whose parents (and sister) have been murdered. The young baby--toddler--wanders into the neighboring graveyard and happens to escape the killer. The residents of the graveyard take pity on him. They adopt him. Mr. and Mrs. Owens especially. (Along with Silas.) Give him the freedom of the grave yard. They raise him. They teach him. He is one of their own. And yet...and yet he's not quite of them. He's alive. Can the dead really and truly raise the boy right? Silas is his guardian. He is one of the few that can leave the graveyard. He walks amongst the living and the dead. Him being quite neither. They only know this. Someone is out to kill 'Bod' (their nickname for Nobody). And it is only if the boy remains there that he is safe. But how long will the boy be content with them, with only the dead for company, alone from others his own kind? This is an adventure-filled story with great characters and amazing atmosphere. The book is slightly unusual in that it is episodic. The book spans a dozen years or so. We see Bod grow from a toddler to a young man--a teen boy of fifteen or sixteen. We see him learn to walk and talk and fade and haunt and dreamwalk. We see him learn to explore the world around him both in and out of the graveyard. First sentence: There was a hand in the darkness, and it held a knife. great review, I've been wanting to read this one. I had to skim because I'm reading this next and I was afraid of even the slightest spoilers. But I'm glad to see your "definitely recommended" at the bottom! I'm always on the lookout for novels for my nine-year-old son (who is a great reader, but leery of much fiction.) This looks great! I read this last week and really enjoyed it (am a little behind on reviews sadly, but should be up before the end of the month). I am glad you liked it as much as I did. The perfect read for this time of year. PS I just put up a wrap up post of the Inklings Challenge, thanks for hosting!